Hi, I breed double doodle puppies. They are a mix between goldendoodle and labradoodle. That makes them multigenerational non shedding doodles :). My pups are Microchipped and CKC registered. They come with a 6 month limited health guarantee. I have six currently available. Visit .looneypets for more pics and info. We can ship in the US for about $250. Our heart for Doodles began with a desire to raise sweet, obedient, family pets that could also serve as therapy dogs. All our pups go through the Biosensor/Superdog early neurological stimulation program. Located in Utah, I breed family dogs: raised in a family, ready for a family. We are not a kennel and our dogs are raised in our home so they&amp;amp;amp;#039;ll be ready to come to yours. Looking for a reputable Double Doodle breeder in your area? 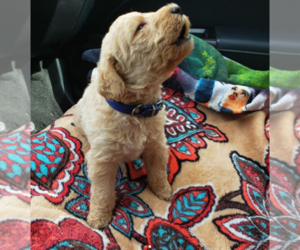 Simply browse through our nationwide directory of 1000s reputable Double Doodle breeders - complete with website addresses, dog breed profiles, and current puppies for sale.